So I mentioned yesterday that we still DIY when on vacations. We generally try to do things that would help out or things that our hosts wouldn't necessarily be comfortable doing on their own (like electrical). The project I'm going to share with you today we actually did last year but I neglected to take any pictures... this trip I didn't remember to take pics until the last night and since we were leaving early, I am left with kind of dark pictures... but we are going to go with it. This is my childhood bedroom. It's basically a fat T shape with a nook (above) on one side and a closet in the other part of the "T". The open nook was a spot that we tried to do things with for years, but it usually ended up being a catch all. It's not the biggest room in the world so with the bed and things collecting in the corner, the room felt even smaller. Solution? It turns out that the nook is actually the exact width of a full size bed so recently my mom moved the bed into this space. 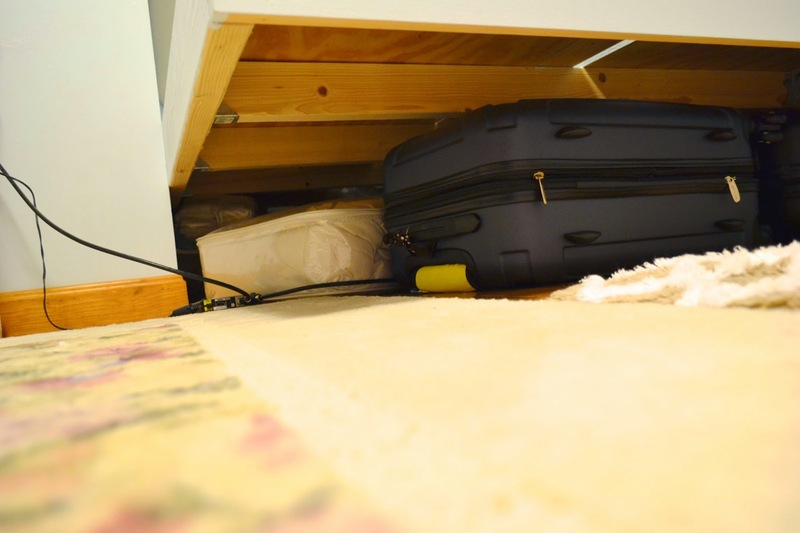 It was working pretty well, but she also wanted to use the space under the bed to store suitcases and travel gear. To get enough space, she had the bed frame up on risers and that was, well... a little unstable. So, while we were visiting, we offered to build a floating platform for the bed. 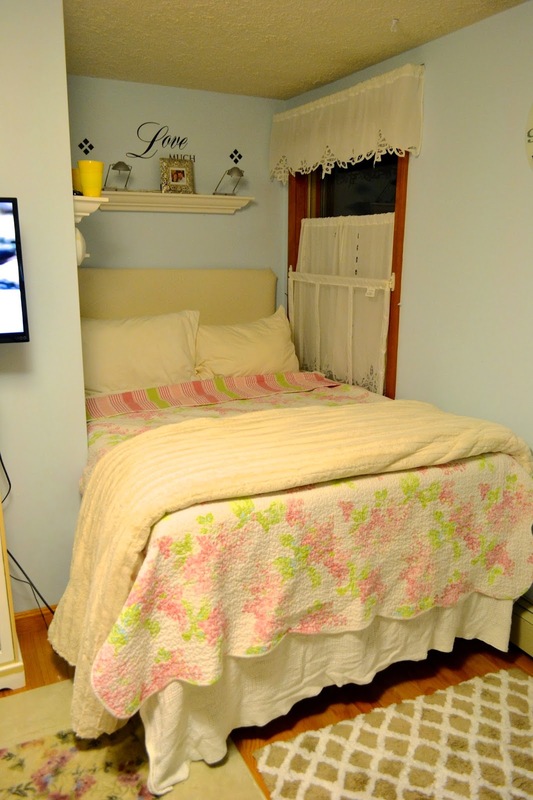 The frame needed clear the baseboard heater and preferably keep the mattress under the window sill. After some measuring and tinkering, we had a plan. We basically built this platform like a deck. We bolted the 2 x 4's to the wall (attaching into studs) and then attached joist hangers. Once the hangers were installed, we could pop in the 2x4 cross pieces. We attached the plywood tops and the end cap with some screws and we were done! My mom painted it later after we left to finish it off. The longest part of the project was simply getting the materials. After that things went really quickly. We were initially going to add a leg to the exposed corner but after some fairly high level experiments (when else are you allowed to jump on the bed? ), we concluded that there wasn't a need for one. 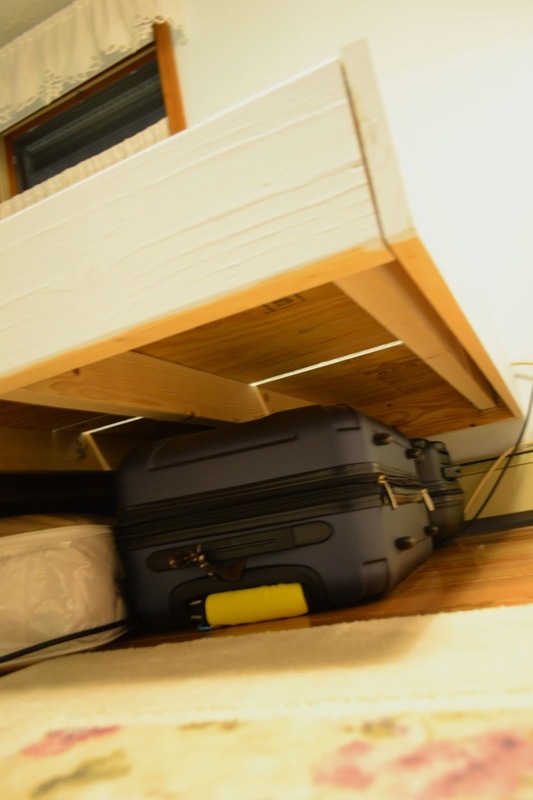 This also makes sliding suitcases in and out super easy and there is no worry about stubbing your toes! 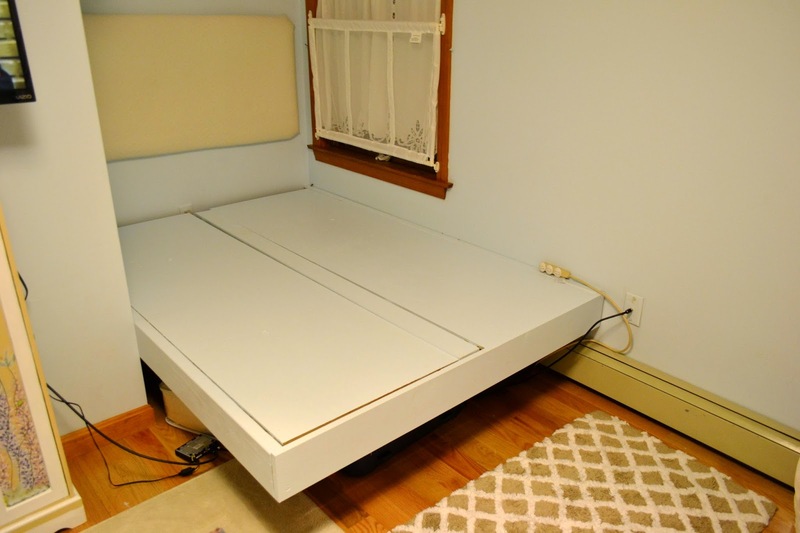 When the bed is made, you can't even tell that the bed is floating and since it's a platform, you don't need a box spring (although it currently does have one on there). This is where we stay when we visit my parents so this project was a little selfish but it also made the storage more accessible so we are going to file it under the helpful category. Are you like us and can't stop DIYing even on vacations?